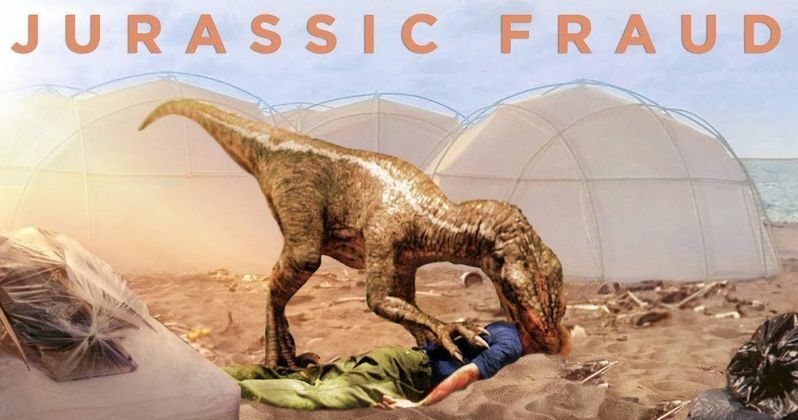 Jurassic Park meets the Fyre Fest in a new documentary mashup. The Fyre Fest received two documentaries, one titled Fyre and one titled Fyre Fraud, that were released at the same time and people have been having their minds blown about how bad it really was behind-the-scenes. There was literally no organization and the goal the whole time seems that it was made to rip people off. However, those two documentaries have nothing on the latest Jurassic Park spin, which works way better than you're probably thinking in your head about now. When one stops to think about it, Jurassic Park and the Fyre Fest have a lot in common, which is laid out perfectly in the faux trailer for Jurassic Fraud. Fyre CEO Billy McFarland is replaced with John Hammond and things are really almost too perfect from the way that the video is edited. The terrible sleeping conditions are shown and then dinosaurs are seen roaming around freely. The infamous water scene from the Fyre documentary is brought back in all of its glory, but it gets a twist when one of the men trying to deliver the pallets of water gets eaten by a dinosaur. Even the food from the Fyre Fest, which quickly went viral from being a piece of bread with cheese on it, is shown, but this time it's replaced with the lime Jell-O from Jurassic Park. Nearly all of the movies from the Jurassic Park franchise are used to construct the Jurassic Fraud documentary and it will leave you wishing that it was longer than just the nearly 3 minutes that it is. It's quite surprising to see how many accurate parallels that there are between the fictional John Hammond and the real-life Billy McFarland. Both John Hammond and Billy McFarland purchased islands and "spared no expense" when trying to lure consumers there. Even though Jurassic Park is fiction, Hammond at least delivered on his original promise, which was to have humans and dinosaurs interact, though he didn't anticipate things getting so bloody. McFarland, a failed CEO, couldn't even get Blink-182 or Ja Rule to show up to the Fyre Fest and perform. There's even a pretty hilarious bit about having to go buy thousands of toilets, only to have Jeff Goldblum's Dr. Ian Malcolm come up on a giant pile of dinosaur poop. Obviously, Jurassic Park ended with some casualties, while Billy McFarland is just in prison trying to teach fellow inmates about music production. Regardless, even if you loved the Fyre and Fyre Fraud documentaries, you're probably going to enjoy Jurassic Fraud a lot more because it's fictional people getting ripped off, and in some cases, ripped apart, not real humans like McFarland pulled off with the Fyre Fest debacle. Regardless, you can watch the awesome parody below, thanks to the Nerdist YouTube channel.